So this morning I woke up early to whip up a batch to bring to all of my singers at rehearsal tonight. But as I was making the dough, it hit me – why not toss in some apples and make…appledoodles?!? So before popping them in the oven, I mixed some diced apples into the dough (although I would recommend dicing them slightly smaller than I did today), rolled them in that classic cinnamon-sugary goodness, and voila — a new favorite cookie! Couldn’t think of a yummier way to get my “apple a day”! 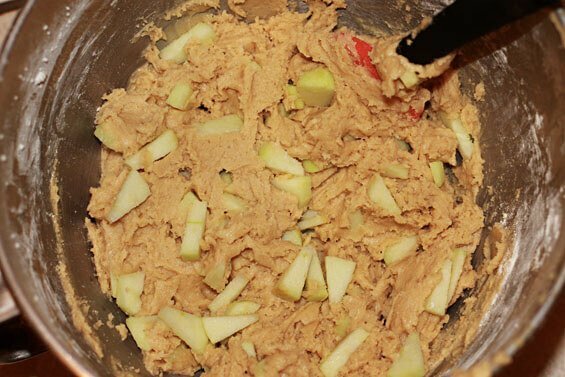 Your favorite chewy cookie with some delicious diced apple mixed in! 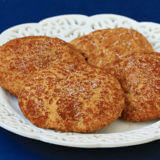 You will love this Appledoodles (Apple Snickerdoodles) recipe! Preheat your oven to 350°F. In a mixer, cream the butter on medium-high speed until it’s soft, smooth and light. Add both of the sugars to the creamed butter and mix until they are fully incorporated, and lighter in color. Stirring vigorously, add the egg to the mixture and beat until the batter looks uniform. In a separate bowl, stir together the flour, cornstarch, baking soda, salt and nutmeg. Then slowly fold into the batter until just combined. Then add in diced apples, and gently fold them by hand into the batter until well-distributed. Form balls of dough (I used a cookie scooper) and plop them in cinnamon sugar, swirling to coat. 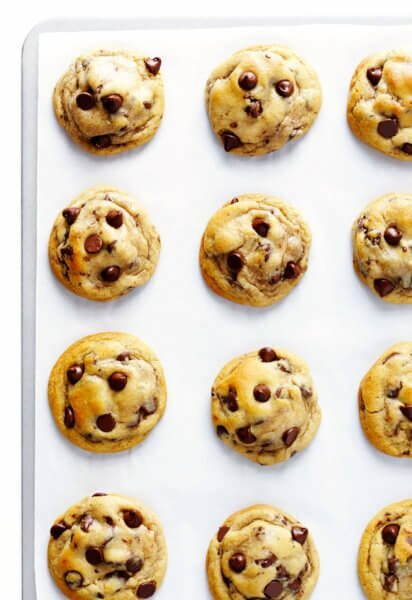 On a greased or parchment lined cookie sheet, place the dough balls 3 inches apart. Use your fingers to press and flatten the dough slightly and sprinkle an extra pinch of cinnamon sugar on the flattened surface. Set the first timer for 7 minutes. Turn the pan around and set a second timer for 7 minutes. If you are using a greased pan they might be done at this point, or need another minute. If you’re using parchment, cookies will take 2-3 minutes more. You are looking for golden edges and a blonde middle. Cool on a baking sheet and enjoy. 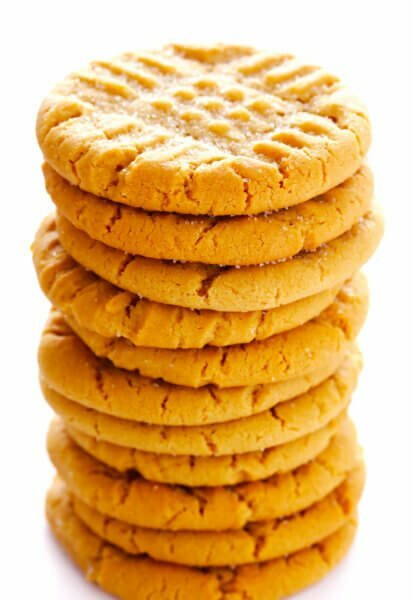 Snickerdoodles will keep in an airtight container, at room temperature for 3 days, but they are best eaten the day they’re made. I am going to go make a double batch. Right. Now. Delicious!! I wonder if adding a little applesauce to the dough would make it even deliciously apple? Either way, mmmm! I don’t think there is anything better than apple and cinnamon together. Absolute perfection. Sounds wonderful!! Can’t wait to make them! I’ve got a great apple granola pancake recipe that I’ll have dig up and share. I LOVE snickerdoodles!! They are definitely a favorite holiday cookie for me! Thanks for encouraging me to step out of the snickerdoodle box and be creative. This is wonderful!!!! Who knew!? I don’t think I’ve ever had a proper apple cookie but this is fantastic, what great cookie into which to incorporate apples. I love snickerdoodles, but my favorite has to be the oatmeal craisin. Those look amazing!!!!! Perfect for fall! Excellent idea. I love texture of snickerdoodles, though. Instead of or in addition to apples, do you think added pumpkin puree would change the texture too much? I LOVE snickerdoodles. Definitely have to try these! What a great idea! I think I will make a batch of these this weekend – yum! My husband loves snickerdoodles- now I can sneak some fruit into them! Thanks! Snickerdoodles are my ALL TIME FAVORITE cookie! I would have never thought to add something to them, but apples sound perfect! I am a person that does not like nuts in my cookies so getting some extra flavor in the cookies without nuts is great! Made a double batch last night and they were -FANTASTIC-. The apples are chewy little surprises :3 I had to borrow brown sugar for some neighbors and they loved their gifted cookies as well! heehee. The first batch, fresh out of the oven…I can’t even describe them. They were perfect. Whenever I attempt cookies they don’t turn out well, but I called these my first success! The cinnamon was the cherry on top~ The second batch I decided to use twice as many apple chunks since they’re so neat, and my roommate mashed up some chunks to add to the batter. They made the cookies more cakey, and I’m trying to figure how to solve since my cookies usually come out that way. In any case! They’re easy, nummy, and go great with hot chocolate. Thanks for sharing! GREAT idea!!! I’m planning on making a big batch of snickerdoodles for my Thanksgiving family reunion. I have to try these as well!!! Thanks for another wonderful recipe idea! I would never think to put apples in my cookies. I definitely want to try this recipe out. I love snickerdoodles! When I first came upon this recipe via foodgawker, I thought you had found an alternative to using applesauce intead of butter! But this is an even better use of apples. Must try soon! That’s a pretty genius riff on an old standard. Sounds perfect for fall! This looks so good! 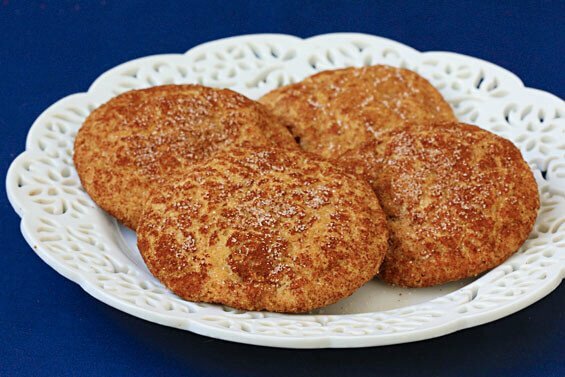 I can’t wait to try these apple snickerdoodles. What a clever twist on such an old favorite. Sounds delicious! What a GREAT is idea!!! I love snickerdoodles!!! geesh! where do you get all of these amazing recipes? yummy yum. I have to admit that I have never had apple cookies, but these look good! These look so tasty! 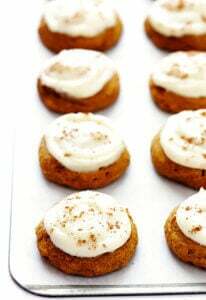 I have been looking for a fall cookie recipe that would be sweet and tangy all at once. Another one I found is molasses cookies with lemon glaze. Yum! Its brilliant! Apples with cinnamon is my fiance’s favorite!!! And he loves Snikerdoodles! So Apples in Snikerdoodles!!!!! Ooooh, I love snickerdoodles. Putting apple in them is a great idea, I can’t wait to try this recipe. what type of apple would you suggest? from the picture, i guessed golden delicious. This is just like making chocolate chip cookies but are rolled in cinnnaom-sugar and apples are used instead of chocolate! I just made these tonight and they are fantastic!! I had some mini cinnamon chips left over from another recipe, so I stirred in about 1/3 C of those along with the apple chunks. 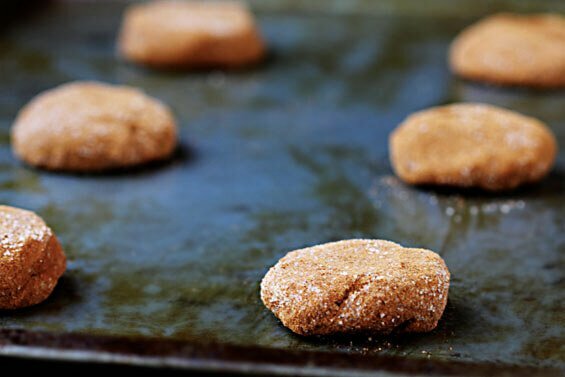 The texture of these cookies is perfect – crisp on the outside, soft but with a little chewy bite on the inside. Thanks! I have many cans of apple and cherry pie filling can we use it in these? Awesome recipe. But very inconvenient without metric measures, for Canadians. I figured since I was making these a second time that I should leave a comment. These are AMAZING! Like someone else said, I added cinnon chips, but I know they’d be awesome even without. Thank you for sharing! I’m always skeptical when there are no reviews for a recipe, but I just made these today for Thanksgiving and they’re a huge hit! Crispy outside, soft inside. My husband doesn’t do desserts, and he snuck 2 of them off the cooling rack (and tried for more..). The dough was very sticky, so I chilled mine for 10 min and it was much more manageable. Used the nutmeg, and added a dash of allspice and cinnamon in the batter. Used parchment paper and found the 14 min like the recipe calls for is perfect, any longer they’d be too hard. Also pulled them right off the cookie sheet immediately and put on a cooling rack. I will definitely be making these again!